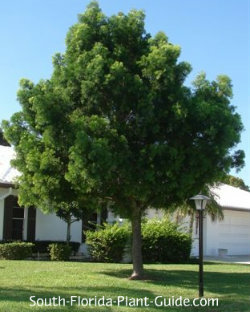 Looking like a green cloud in the landscape, the graceful weeping podocarpus tree makes a great shade tree for most yards. 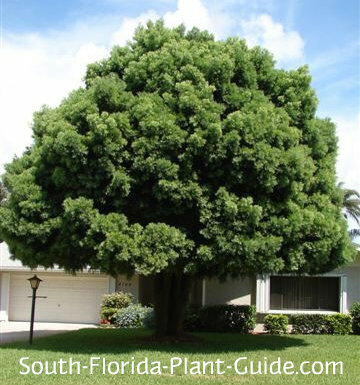 With drooping branches full of soft, fine-textured foliage, the podocarpus is one of the prettiest weeping trees for South Florida. The branches can be left full to the ground, or as the tree matures, trimmed up to reveal the trunk (and allow foot traffic beneath). This tree's dense, billowy foliage creates nice, deep shade, and the tree is not too large to use near a patio or home to provide just that. 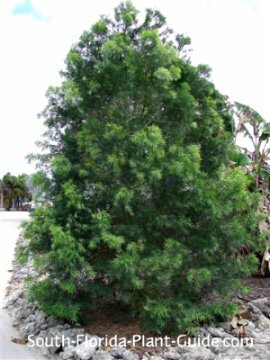 Other varieties of podocarpus include a dwarf shrub and a full-size shrub, neither of which have the weeping habit of the tree. Weeping podocarpus is a slow to moderate grower that can eventually reach 30 to 35 feet in height. It's cold hardy - fine in Zone 9B or anywhere in Zone 10 - and moderately salt-tolerant. This evergreen tree needs a well-drained location. It will do well in almost any light...full sun to part shade. Add top soil and composted cow manure to the hole when you plant. Trimming isn't necessary unless you want to remove lower branches. Normally the low foliage is left sweeping the ground while the tree is young and then lower branches are removed as the tree matures. Drought-tolerant once established, a weeping "podo" does best with regular irrigation and time between waterings for it to dry out. If nothing else, at least water well during dry spells. 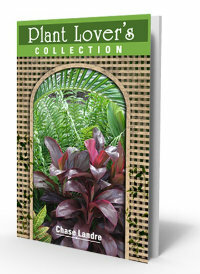 Fertilize 3 times a year - in spring, summer, and fall - with a quality granular fertilizer. Place this tree about 10 to 15 feet from the house. Surface roots are generally not an issue, so you'll only need to come in from a walk or drive about 6 to 8 feet (or more) just to allow for branch spread. 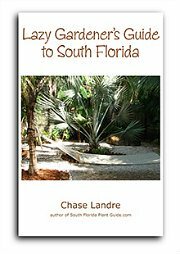 COMPANION PLANT SUGGESTIONS: Underplant with low-growing plants like lantana. vinca or bush daisy. 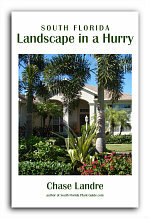 Nearby plants might include thryallis, copper plant, Maui ixora, buddleia, dwarf allamanda and ligustrum.